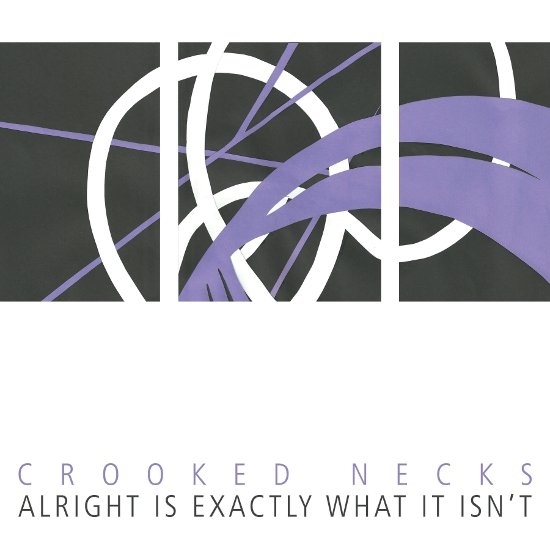 Coming to me via the excellent Handmade Birds label, Crooked Necks dropped into my world via an LP, Alright Is Exactly What It Isn’t, and a Joy Division covers 12” EP with little to no warning as to what I could expect. Then, I sat on both of the records a bit without listening to them until one day, I was rifling through my pile of to be listened to LPs. As the album played, I was mentally kicking myself for not putting Crooked Necks on sooner because the record struck quite a few chords. I was given the chance to talk to one of the two members of the band and pick his brain to see just where Crooked Necks stakes its roots. Scene Point Blank: What are your top 5 bands or artists of all time? What are your 5 desert island records to keep with you? Vinyl, cassette, CD, digital, or does it not matter to you? Sonic Youth, The Cure, Throbbing Gristle, Nico, and Joy Division, although there are quite a few more that almost as equally important to me as an artist. I definitely prefer all forms of analog media to those of a digital nature. Vinyl is by far my favorite format as a whole, with cassettes being a close second. I really don't care for CDs and digital formats at all, for the most part. There's just something about vinyl and cassettes that seems so special to me. Yet, I did grow up in the 80s and discovered music through these formats before the advent of any digital format. 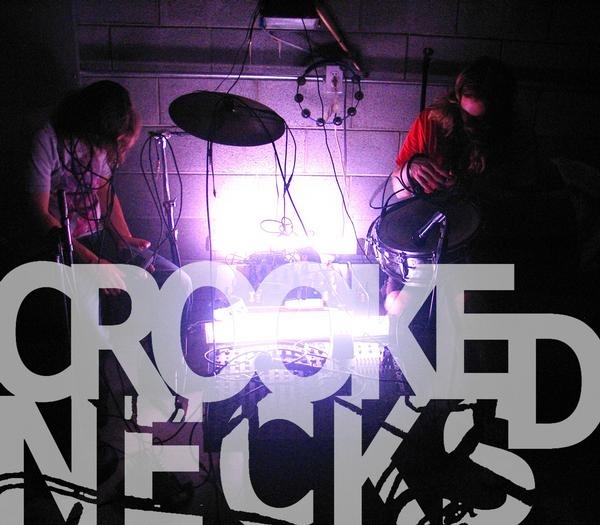 Scene Point Blank: Crooked Necks straddles several genres. How intentional was this? Did your past projects inform Crooked Necks? What goals did you both have when you set out? Who would you say your musical peers are? Shane: It wasn't necessarily intentional that we incorporate elements of several genres, it just happened naturally. Our only intention with this project was to have it be completely removed from any metal-related project that we had both been involved in prior to starting the band. Our sound was originally based on our love of the post-punk and dark pop genres and the desire to create something new within that context. Our past projects in black metal haven't directly informed our sound, although perhaps they have subconsciously. Scene Point Blank: Who would you say are your musical peers? Shane: It's hard for us to identify any musical peers, simply because we feel that we’re doing something that is personal and individual to us. Although, admittedly, there are elements of other styles that are incorporated, we have put effort into remaining as autonomous from any specific scene or genre as possible. Scene Point Blank: Do you think that this lack of a genre or scene helps you or hinders you or both? Does the lack of community within a scene create more barriers or break down others? How comfortable or uncomfortable do you find it putting out something so personal? Shane: Personally, I feel that the lack of genre is a plus for us. Its allows us to operate within our own context without expectations. It enables us to create freely, without feeling an obligation or pressure to adhere to the aesthetics of any one genre. The lack of community doesn't create any barriers for us. It's very important for us to function individually. We prefer it this way. Scene Point Blank: How comfortable or uncomfortable do you find it putting out something so personal? Shane: It can be somewhat uncomfortable putting out something so personal, because you're exposing a part of yourself by doing so. However, it's worth it just to know that you're allowing yourself to create something so honest and completely devoid of self-censorship. Scene Point Blank: Does the distance between the both of you create some interesting dynamics in the writing process? How do you deal with the challenges that this distance causes? Or would you say that the distance itself helps in some of the themes of loneliness and detachment? Shane: I'm sure, by default that the distance between Andy and myself adds to the dynamic of our writing process. Instead of creating something together from its inception, we're instead creating two individual facets to the material and integrating them into something different altogether. Our sound would probably be quite a bit different if we were to write/record together as a unit. To be honest, the distance doesn't really create any challenges for us. We started out with this approach and it has always been the thing that works for us. It's been our natural way of doing things for this project. I write/record all of the instrumentation solely by myself, without any input from Andy. He also does the same when it comes to writing the lyrics/recording vocals for the material. So, the distance doesn't complicate the writing process at all. I do feel like the distance contributes to the feeling of loneliness and detachment within our music. Creating something so uniquely personal, and by yourself, reflects those feelings. We keep everything to ourselves and separate from one another, which in many ways adds to the feeling of being alone. 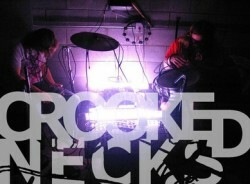 Scene Point Blank: Would you consider Crooked Necks a “live band” that records albums or a “studio band” that plays live? What is the more important setting to hear Crooked Necks? Shane: Actually, we really couldn't be considered either. We certainly aren't a "live band” in any respect, as we don't record together at the same time. Also, we're unable to play live due to lack of live session members and due to the fact that the both of us live in separate states with a long distance in between would make it very difficult to rehearse as a unit. Because of this, the more important setting to experience our material would obviously be on record. Scene Point Blank: Your latest record is Alright Is Exactly What It Isn’t and you also released a Joy Division covers 12” EP and a split with Circle of Ourborus. What other recordings has Crooked Necks made? Did they inform this latest record? Shane: Those are the only recordings that we've done under the Crooked Necks moniker. Although our first demo, Brilliant Darkness, and the original pressing of the Joy Division covers were done under the name “Frail.” None of those directly influenced the new record, besides having provided a general framework of style that we continue to operate under to the present day. Scene Point Blank: When writing Alright Is Exactly What It Isn’t, did you set out to specifically write that record or did the album evolve from writing sessions? What informed and influenced your writing at the time? Shane: We did have a rough idea for the overall concept of Alright... prior to recording, though we always allow the material to develop on its own. Alright... was intended to be a down-tempo album with an overall lush and fragile vibe, conducive to nights spent alone in solitude with only thoughts and feelings as company. Emotions such as loneliness, detachment, and failure were all contributing factors on the album, as well as the depressive works of some of our favorite bands. The album was meant to bring about mental scenes of lost relationships, nostalgia of times gone by, and sometimes the melancholic hopelessness that one can experience when reflecting upon such things. Scene Point Blank: Did you do a great deal of demo recording prior to actually recording the album? Did the songs further develop or change drastically once you started recording? Shane: Generally, we don't demo our songs prior to the recording sessions. I usually record a batch of improvised drum tracks, and then write the songs based around those improvised structures. The songs almost always develop and change as the recording progresses, since I usually base the initial parts on emotions rather than concrete ideas. Scene Point Blank: How much spontaneity was allowed on the album? Shane: Spontaneity is basically an integral part of our writing/recording technique. Everything is improvised until the song has taken on what we feel is it's intended form. Scene Point Blank: How long did the recording process actually take? Shane: The time it takes us to record material usually varies. For Alright..., specifically, it took around four months of intensive work to write and record all of the music and vocals before we had completed the desired final product. Scene Point Blank: Were lyrics and vocal arrangements written before, during, or after the music was written? How important are lyrics to your songs or is the vocal melody more important? Shane: The lyrics and vocal arrangements are always written and recorded after the music is already finished. I write and record all of the music solely by myself before sending the material to Andy. We typically don't share any indication of what direction either one of us are taking our respective parts in. We each have our own piece of the project that we handle independently of one another. The lyrics and vocal melodies/arrangements are equally important, although we don't see any one element of our sound as taking precedence over anything else involved. We prefer to allow all of the parts to create a cohesive piece instead of any element standing out as "solo." Scene Point Blank: Is there anything that you would change about Alright… (mix, master, recording, etc)? What is your most memorable moment on the album? Shane: At this point in time, I can't think of anything that I would choose to change about Alright... I think what we succeeded in with the album was achieving the overall mood and atmosphere of our style. It has proved to be a rather accurate snapshot of that particular period in our evolution thus far. I don't have a specific moment on the album that is more memorable than others, but rather the album as a whole is very memorable to me. It was our first full-length and was recorded during a very tumultuous time for us, both creatively and personally. Scene Point Blank: Reviews…do you read the ones of your own records? Are digital zines as legitimate as print ones? Do you think the internet is good or bad for music? How has it helped or hurt Crooked Necks? Shane: Yes, we do tend to read reviews of our material as it's usually interesting to see how others are interpreting our works since, for the most part, we are generally a difficult act to comprehend. In my opinion, some digital zines are just as legitimate as printed ones. With the good ones being those which are executed with the same amount of attention to detail and professionalism as a large amount of the printed ones. Although, I personally prefer printed underground zines with a crude aesthetic to all others forms of the medium. As for the internet's impact on music, I feel that it can be both good and bad. Good in the respect that it can be a platform to discover new music, but bad in the respect that the majority of a band's appeal to most people can be based on the amount of hype that they receive. Another negative aspect is that it seems like a large part of people base their opinions simply on the opinions of others without striving to create their own. I think any impact the internet has had on our project is overall indifferent, besides maybe introducing our material to some worthy individuals who may have not been able to discover it otherwise. Scene Point Blank: What is the next step for the band? Have you started writing the follow up to Alright…? What direction are you thinking of going with Crooked Necks next? Shane: Our vocalist is currently working on finishing incomplete material which dates back to 2009, recorded during the same sessions as Alright... The re-release/re-recordings of Brilliant Darkness are still scheduled to be released via Handmade Birds sometime in the future. I’m also planning on beginning the writing process for the next full-length in the very near future as well. The future material will more than likely be a mixture of the more lush material from Alright... mixed with elements of the more up-tempo stuff from the split with Circle of Ouroborus. Although the material usually takes on a direction of its own once the process has begun, so this is of course subject to change. Words by Bob on Feb. 18, 2012, 8 a.m.
Posted by Bob on Feb. 18, 2012, 8 a.m.
Posted Feb. 3, 2014, 8:33 p.m.
Posted Sept. 2, 2013, 3:50 p.m.